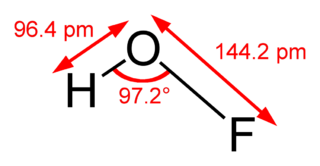 The solid-phase structure however has a bond angle of 101 degrees. Why is there a difference in the solid and gas phase bond angles? Is this due to packing in the solid-phase? In the solid-phase the molecules should be much closer together than in the gas-phase, so I expect more intermolecular forces and interactions. However, what exactly would be responsible for the angle expansion in the solid phase? From one book I read that bond lengths often differ among the phases. So what exactly is behind the bond angle expansion in the solid phase? It is due to hydrogen bonding in the solid but not gas phase, in analogy to what occurs for the water bond angle. From a VSPER point of view, the oxygen atom of one molecule would form a hydrogen bond with the hydrogen of another molecule, decreasing the repulsion of the lone pairs to be closer to that of the covalently bonded pairs, so the geometry would be closer to tetraherdral in the solid phase than in the gas phase. Not the answer you're looking for? Browse other questions tagged bond or ask your own question.